Robert ‘Bob’ Taylor was almost 10 years old when he was called to the office of the Catholic orphanage where he lived in Salford, Lancashire, England. He was told that his full name was Robert Bernard Taylor, that his date of birth was 12 September 1939, and that he needed to memorise these details. As it turned out, these were the only two real facts that Bob would know about his own identity for more than 76 years. In May 1950, Bob was sent to Australia as part of a child migration scheme between the British and Australian Governments. With dozens of other young children, he departed England on the R.M.S. Otranto, bound for Fremantle, Western Australia. The next six years are another whole story, as his new home turned out to be the notorious Boys’ Town Bindoon in Western Australia. It was run by the Christian Brothers, who mentally, physically and sexually abused the boys and used them as labourers to construct their very grand Technical and Administration buildings out of stone. Bob’s search for his mother started once he left Bindoon at age 16. He travelled to England at his own expense four times since 1962, trying to find any information on his or his mother’s identity. Doors were shut in his face, documents had been destroyed, and the government authorities and Catholic institutions provided little assistance or answers. Many child migrants were told that they were orphans even when they weren’t, and most knew nothing or very little about their origins. Some of their names and birth dates were changed to prevent families finding them. Bob was one of the luckier ones who managed to obtain his birth certificate that matched his name, place and date of birth. His mother was listed simply as Sheila Taylor – with no age or any clues as to her origins. The maternity home where Bob was born was known to have encouraged single mothers to use false names. Many of the women accommodated there came from Ireland. There was no way of knowing if Bob’s mother’s name really was Sheila Taylor, or if she was even from the UK. Bob sought assistance from many support organisations and researchers over the decades, all of whom tried repeatedly to locate the right Sheila Taylor. Birth indexes list 83 women named Sheila Taylor born between 1900 and 1926 in England and Wales alone. Research was conducted on many of these women – certificates were purchased, some were even interviewed personally – but all those investigated were eliminated from enquiries. Over the years, Bob has shared his story far and wide, both in England and Australia, hoping that someone would know something or recognise some small detail and contact him. With his search still unsuccessful by 2011, Bob published a book called Who Am I?, detailing his life experiences, including his earliest memories in the UK, his time at Boys’ Town Bindoon, his work as a National Park Ranger, and his ongoing search for his mother and his own identity. Sadly, Bob doesn’t even know what he looked like as a child, as he has never seen a photograph, and doesn’t know if any even exist. Thousands of British children were shipped to Australia between 1912 and 1967, many of them stripped of their identities. Nottingham social worker Margaret Humphreys tried to uncover the truth from the British and Australian Governments. Against numerous challenges she established the Child Migrants Trust in the UK and Australia to provide support to the victims and attempted to reunite them with their families before it was too late. Her best-selling book Empty Cradles was made into an award-winning and incredibly moving movie: Oranges & Sunshine. I first met Bob and his wife Carol in late 2015, when Heather Cox and I, both genealogists from the Cairns & District Family History Society, were invited to a Forgotten Australians support group meeting in Cairns. After Bob related his story to us, we reviewed his previous research results and agreed that there was little hope left of finding Bob’s mother via traditional research methods. With our expertise in genetic genealogy, we suggested to Bob that he could try DNA testing. DNA testing is now routinely used by family historians to identify cousins for sharing research, and is also very popular with adoptees and others with unknown parentage to help them find close biological relatives. We run an active DNA Interest Group in Cairns, and I administer the Using DNA for Genealogy – Australia & NZ and DNA for Genealogy UK support groups on Facebook, so fortunately for Bob he was in the right place to get help. After a few weeks of considering the genetic testing option, Bob decided to give it a go and sent away his saliva and cheek cell samples to two different companies. A couple of months later, his DNA had been processed and was added to large databases to be compared with more than two million other testers. Bob’s DNA results were ready to view in his online account in late 2015 and January 2016. His results included ethnicity estimates as well as lists of other individuals who share some of the same DNA. The more matching DNA that two people share, the more closely they are related. We were hoping for a second cousin match or closer, as Bob could share a set of great grandparents with a second cousin. Then we could research all their children and then grandchildren, with the hope that one of them could be identified as Bob’s mother or father. Genetic genealogy uses DNA testing combined with traditional family history research to infer relationships between individuals. The DNA testing finds the biological relatives who have tested at the same company, and we use the historical records to try to work out how they connect with each other. It is all one great big puzzle: the challenge is to connect the dots… examine the DNA cousins’ family trees, see how they connect to each other and try to work out how Bob connects to them. Just which set of each DNA cousin’s ancestors does Bob share? Could we solve the puzzle? For some people it can take years to solve the puzzle, for others it happens very quickly – and there is no way of predicting success before testing. But as more and more people are testing their DNA every day, new matches are added to the databases and more people will get closer matches and have more success. Heather and I searched the family trees of all Bob’s closest matches, and any other matches that had a connection to Lancashire or had the surname Taylor in their family tree. We examined how many of the matches connected to each other. We researched the descendants of the possible shared ancestors from Bob’s closest matches. With a bit of luck, Bob’s mother or father could be a grandchild or great grandchild of one of them. Bob’s closest DNA match was a man living in the US who was predicted to be a third cousin. Luckily he had a family tree and responded helpfully to our messages. His grandfather emigrated from London in the early 1900s. His grandmother’s line came from Lancashire, so given that Bob was born in Lancashire, we initially spent a lot of time researching her extended family in that county. Up and down all the different branches of his family tree we climbed, day and night, hoping to hit the jackpot. We didn’t even know which side of Bob’s tree this match might be on, maternal or paternal. Just before midnight on 29 February, it happened – the puzzle was finally solved! I dragged my husband out of bed to check my computer screens to make sure I wasn’t imagining it… after these intense few months, I almost couldn’t believe it myself when I saw it! I had been researching up and down another branch of a different grandparent of Bob’s closest match, using the marriage indexes to look for spouses of this grandfather’s many siblings. It wasn’t as easy as it sounds, as this was a very large family whose children were born in different countries, they were often travelling or missing from the usual records, and they constantly changed between using full names, initials, nicknames and middle names, and their surname was not unique either. But there it was: one of Bob’s DNA cousin’s grandfather’s many sisters in London had married a Taylor! I braced myself as I searched the birth indexes to see if they had any children, not thinking that we could be so lucky. The results appeared, and there were two daughters …and one was named Sheila Taylor! Bingo!!! As it turned out, Bob’s closest DNA match was in fact a second cousin on paper, sharing a set of great grandparents with him. Bob’s match with his previously-unknown cousin’s DNA has led us to the right Sheila Taylor out of potentially hundreds of women with the same name. Further research into the wee small hours revealed that Bob’s mother Sheila had passed away decades ago, so it was sad to confirm that we were too late – even though we presumed that she would have to have been at least in her 90s. After Sheila’s death, her sister learnt of Bob’s existence and she and her children went to considerable efforts to try to find him, including using a lawyer to place newspaper notices in the UK. Their searches were unsuccessful due to the lack of records, being told that Robert had been adopted out under a different surname - possibly in Wales, and having no idea that he had been shipped to Australia as part of a child migration scheme. It was then that I recalled something from Bob’s book: on his first trip to England to find his mother in 1963, aged 23, he spent several months working for the mowing gang at London City Council. His mother lived in the Greater London area. I just can’t help but wonder if they may have crossed paths at some stage. Did he go past her house? Did she sit or walk through a park or garden whilst he was cutting the grass? Did they walk near each other in a shop or street? Was he drawn to London, away from Lancashire where he could find no answers? He and his mother may have come so close to each other. After allowing some time for Bob to absorb the news and manage the intense emotions involved, contact was established with his closest surviving relatives in England. Sheila’s only sister had also passed away, but her three children – Bob’s first cousins – knew they had a missing cousin named Robert, so they were very excited that Bob had finally found them! Understandably, after such a long search, Bob still can’t believe that he finally knows the real identity of his mother, his birth circumstances, and that he has finally met some blood relatives. Bob’s new family have all been so amazing since he first contacted them… extremely receptive, caring and very thoughtful. They emailed Bob and Carol very frequently, sent him some photos of his mother and information about her life, and couldn’t wait to meet him in person. Thanks must go to the British Government for providing the funding via the Child Migrants Trust for Bob to be recently reunited with his family. During July, Bob and his son Gary were flown from Australia to Spain to meet and stay with Bob’s first cousin, Anne Boughton. Their mothers were sisters, and there is definitely a strong family resemblance! After their visit to Spain to meet and get to know Anne and her husband Mike, Bob and Gary travelled on to London to meet and stay with his cousins Rod & Chris (Anne’s brothers), and also spend a few days with one of Anne’s daughters, Claire. They treated Bob and Gary to some memorable family meetings and get-togethers, including one gathering of 22 relatives (and Bob remembers all their names)! Bob (front row, 4th from right) with his big new family in London. Cousins Chris and Rod are standing behind Bob. Bob was very chuffed to be called Cousin Bob and Uncle Bob for the first time. Bob’s son Gary got to meet his first ever paternal cousins. This family meeting was a very long time coming, and Bob now has some very special memories. During Bob’s visit to London, he finally achieved his lifelong wish, which has been to find his mother’s grave. Thanks to the genetic secrets in his saliva and cheek cells, Bob now knows who his mother was, where she is resting, and he has spent some special time visiting, laying flowers and tending her grave. See some photos of Bob achieving his lifelong wish, visiting his mother's grave in Kent, England. Bob’s life has now changed forever. His wonderful cousins have welcomed him and his family so warmly, and now they are all part of one much bigger family. 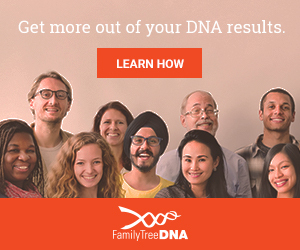 What types of DNA tests are available for family history?